After a series of entertaining matches in the early afternoon, today’s play in Halle continued well into the early evening. While some of the favorites prevailed, others weren’t quite as lucky. 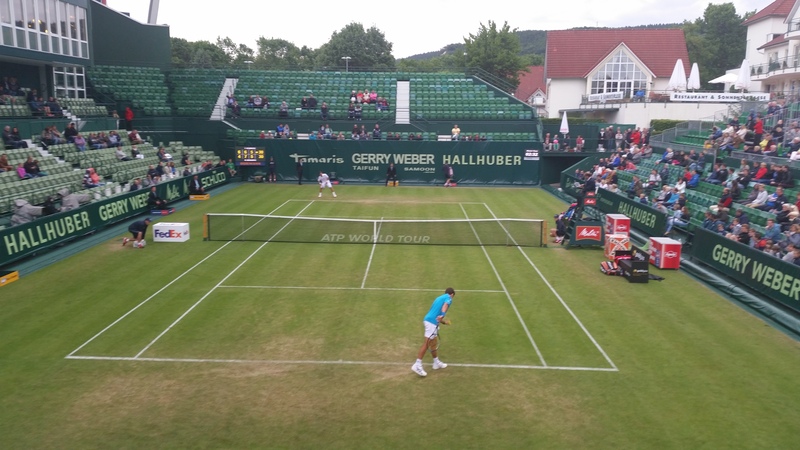 On Centre Court, local favorite Tommy Haas saw his hopes of another big run in Halle fade away in his first round match at the Gerry Weber Open. The German veteran and opponent Andreas Seppi played a close first set, but as Haas himself analyzed in the post-match conference, a couple of points “here and there” didn’t go his way — particularly in the final stages of the opener and early in the second set. Despite the loss, Haas wasn’t too disappointed with his performance today and is keeping expectations realistic. The 37-year-old underwent shoulder surgery on June 17, 2014 and one year later, the former World No. 2 is taking his return to the tour one day at a time — not just with his game, but also with regards to how his shoulder holds up. The veteran also talked about what went into the decision making to come back on the grass and how he sees his next few months shaping up. Straight afterwards, No. 3 seed Tomas Berdych contested the final match of the day against Victor Estrella Burgos. The first set proved to be a close affair, with the man from the Dominican Republic employing a lot of slices and chipped returns, keeping the ball low and making the tall Czech’s first set out on Centre Court fairly uncomfortable. When push came to shove, however, Burgos’ serve let him down; he double faulted on set point down before Berdych put himself in control of the second set en route to a 7-5, 6-3 win. When asked about what he makes of the relaxed tournament environment here, the 2007 champion of the Gerry Weber Open echoed the statements of Roger Federer and some of the other players, welcoming the change of pace from big city to the countryside. Elsewhere out on Court 1, enigmatic Pole Jerzy Janowicz scored a solid straight-set win over No. 6 seed Pablo Cuevas, 6-3, 6-4. Janowicz has been successful on the surface before, reaching the Wimbledon semifinal in 2013, but consistency has been the bane of his past 24 months. In his next match, he’ll meet last year’s finalist Alejandro Falla in what should be an interesting encounter between two players who are generally very fond of the grass courts. Tommy Robredo found himself at the brink of defeat against Ricardas Berankis. The final match of the day concluded well past 8 p.m. local time as qualifier Ricardas Berankis had every chance to move on to the second round against fifth seed Tommy Robredo. The Lithuanian served for the match at *6-5 in the final set, but during the crunch time of the match, nerves got the better of the Lithuanian and he served two double faults, giving Robredo another look at the match. The Spaniard showed off all his experience in the tiebreak, exploiting a momentary, yet significant, lapse of Berankis perfectly to come away with the 6-4, 6-7(4), 7-6(1) win. Robredo will face Seppi in the second round. The day concluded with the players’ party in Bielefeld’s “Elephant Club” — but what happens at the party, stays at the party.